Will Obama’s New Immigration Policy Help in November? This morning, the Obama administration announced its intention to halt deportation and allow work authorization for nearly one million undocumented immigrants: those who arrived in the U.S. before the age of 16, are younger than 30 years old, and have graduated from high school or have military service. The election year decision is certain to appeal to Latino groups, who overwhelmingly support the DREAM Act while opposing the Obama administration’s expansive deportation efforts. While the recession has disproportionately harmed Latino communities—and many Latinos are disappointed with Obama’s failure to vigorously pursue comprehensive immigration reform—the president already commands near-2008 levels of support among Latino voters, perhaps due to Romney’s hardline immigration positions. Given that Obama is already near his 2008 standing among Latino voters, it is unclear whether he has much more room for growth. So how much of an effect will today’s announcement really have? While Obama already possesses an overwhelming share of the Latino vote, enthusiasm and turnout are still a challenge. Latinos vote at a substantially lower rate than the rest of the country; Gallup’s tracking poll has consistently shown Hispanic voters less likely to indicate that they will “definitely vote,” compared to other racial/ethnic groups. Although there is some evidence that Hispanics were already beginning to tune into the race, there is still plenty of room for the president to benefit from rejuvenated Latino enthusiasm. Increased Latino turnout is the most likely benefit that Obama could derive from this position, but don’t discount the possibility that Obama could make additional gains among Latino voters, even beyond his impressive 2008 performance. McCain had a moderate reputation on immigration issues, even if he abandoned comprehensive reform in pursuit of the GOP nomination. Romney’s stances on immigration are even less palatable to Latino voters, and it’s unclear whether most Latino voters are aware yet of Romney’s most controversial stances. 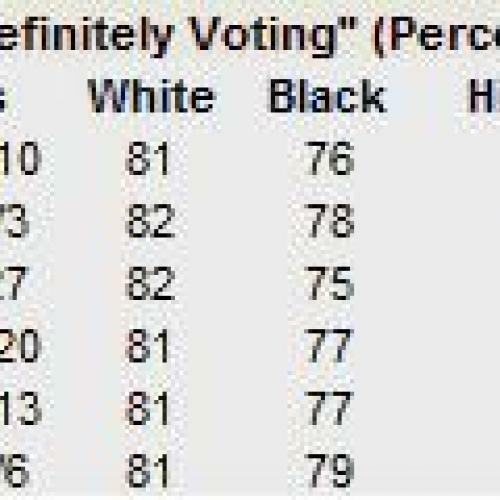 Most polls suggest there are more undecided Latino voters than other racial/ethnic groups, and Romney is generally polling below McCain’s eventual standing among Latino voters. If Obama won an outsized share of undecided Latino voters, he could perform better among Latinos than he did in 2008, even if that seems unlikely given the economic circumstances. This places Romney in a dangerous position. The Romney campaign recognizes the danger of losing an outsized share of the Latino vote, and there was already chatter about a Rubio-led GOP version of the DREAM act. Obama’s new policy has preempted such a move, and Romney now faces the delicate task of appeasing conservatives while avoiding alienating the Latino vote. Romney’s criticism might focus on Obama’s decision to exercise executive authority, rather than pass a bill through Congress—but voters are uninterested in process and Latinos will likely interpret opposition as opposition. If Romney loses the election despite a historic performance among white voters, the Latino vote could be considered the decisive factor. Bush won 40 percent of Hispanic voters in 2004; if Romney was doing that well today among Hispanics, his standing could be as much as a net-2 percentage points better nationally. Since Obama’s historic candidacy dooms Republicans to only the smallest sliver of the African American vote, Latinos will stand out as the group that could have provided Romney the presidency, if only Republicans had managed modest gains in an extremely favorable political and economic climate.